In fact, she felt forlorn. Thelma the horse wants to be a unicorn, and with the help of a carefully placed carrot and an accident involving pink paint and glitter, her wish comes true. Soon she is famous, and travelling the world to the cheers of her adoring fans. But Thelma discovers that fame has its pitfalls, and finds he self wanting to be back home with her best friend Otis. 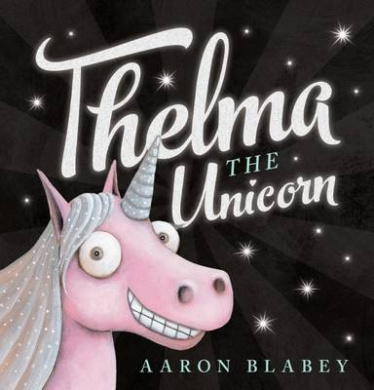 Thelma the Unicorn is a humorous, endearing story in rhyme about self acceptance, popularity and the pitfalls of the celebrity lifestyle. Thelma seems silly, but she learns from her mistakes, and Otis is a loyal friend. The acrylic illustrations are a wonderful complement to the text, with a diverse cast of characters all with big eyes and lots of toothy smiles. Thelma’s pink sparkly coat is contrasted with dark colours as well as use of white space. The rhyming text rolls along with no scansion problem,s making it perfect for reading aloud, and for the repeated readings which it will no doubt demand from young readers.